Six out of 1,000 babies are born with a hole through the heart wall that normally separates the right side of the heart from the left. This hole is known as an atrial septal defect or ASD. The heart can be thought of as a system of two separate pumps; right and left. The left and right pumps have two main parts. The receiving end is called the atrium and a “pumping unit” called ventricle. The right side receives blood from the body and then pumps it into the lungs to reoxygenate it. The left side receives the oxygenated blood from the lungs and then pumps it to the rest of the body. 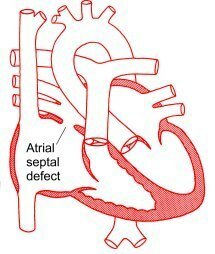 An atrial septal defect is a hole between the right and the left atrium. Having a hole in this wall means that a portion of the oxygenated blood will flow back to the right side instead of going to the rest of the body. This situation will force the right side to work harder and could also cause “flooding” of the lungs and respiratory distress because of excessive blood flow. In some newborns the difficulty in breathing can impair their ability to be fed and cause malnourishment. Medical Therapy – A small Atrial Septal Defect tends to close spontaneously and presents with very light symptoms. If the newborn has no heart failure symptoms and has an excellent response to medical therapy, the pediatric cardiologist will be inclined to observe and wait for the ASD to close spontaneously. In this case, the baby will be followed up regularly with physical examinations and echocardiograms. In some adult patients the ASD is diagnosed much later in life because of new onset of symptoms or the finding of a heart murmur on physical examination. Catheter Therapy – In some cases, especially in the smallest defects, the Atrial Septal Defect can be closed with a catheter intervention. A thin, long catheter (tube) is inserted through the groin and positioned in the heart across the ASD, where it deploys and anchors a special mechanical patch, known as the “clamshell” device. It basically consists of two wire and silicone disks that are deployed to “sandwich” the Atrial Septal Defect closed. Surgical Therapy – A minimally invasive atrial septal defect repair is indicated when the ASD is large and the patient has severe symptoms or when a spontaneous closure is unlikely. More and more well-informed patients with this problem are increasingly interested in a minimally invasive atrial septal defect repair. Surgical therapy, specifically minimally invasive measures, are the best option for many patients. The surgical ASD repair can be essentially described as the closure of the Atrial Septal Defect with a suture line or a patch of the patient’s own tissue…pretty much in the same way a seamstress would mend or patch a hole in a dress! With our minimally invasive ASD repair techniques, the end result is a perfect repair that restores the normal anatomy without leaving any hardware or foreign bodies in the heart. Our patients enjoy the great advantage of a small scar, less pain, a prompt recovery and superior cosmetic results. It is very important to recognize this pathology and treat it before it is too late. An Atrial Septal Defect can in fact cause irreversible damage to the lung circulation and, eventually, premature death. Other complications associated to ASD are strokes and heart rhythm changes. Atrial myxoma is the most common benign tumor of the heart. It often grows out of the “wall” that separates the right and left atrium. This is the same area where ASD’s are found and it is approached with the exact same minimally invasive technique. Women are affected by Atrial Myxoma three times more often than men and they are commonly diagnosed at a fairly young age. Most women are glad to find out that their atrial myxoma surgery can be performed with a minimally invasive approach that will hide the surgical scar out of sight, in the skin fold underneath the right breast. The symptoms caused by atrial myxoma can be pretty vague and an early diagnosis may be missed. Patients can have complaints of dizziness, fainting spells, shortness of breath, fatigue, palpitations. A good number of women I have seen in my office only had a complaint of “not feeling quite themselves”. A good echocardiogram is the best way to quickly confirm the diagnosis and see the exact location inside the heart. Atrial Myxoma can be polypoid, round, or oval in shape. They have a gelatinous consistency with a smooth or lumpy surface and are usually white, yellowish, or reddish. The following picture shows you what they actually look like. This was the case of a 46 year-old lady that was diagnosed after getting a routine echocardiogram. The echocardiogram showed a large lump in the middle of her right atrium. She did her research about minimally invasive atrial myxoma surgery and then came to see me to have it removed with a scarless surgical approach. The excellent surgical exposure you see in the picture was obtained through a small incision in the skin fold underneath the right breast. You are basically looking directly inside the right atrium. The Atrial Myxoma is often bulky and friable. The main concern is that it can cause serious symptoms such as strokes and heart attacks when fragments of tumor break off and travel to the heart or the brain. If it is very large and mobile it can also cause heart malfunctions by literally “plugging” up the heart valves. For all these reasons, an Atrial Myxoma needs to be removed surgically as soon as possible to avoid irreversible damage to the heart, the brain or other distant organs that can be affected by embolized fragments of tumor. The next picture shows you the same case after the atrial myxoma has been removed along with the portion of the atrial septum it was attached to. The remaining hole where the myxoma was is patched closed (white circular patch), pretty much with the same technique used to patch an ASD closed. Once the patch is securely in the place, the right atrium is sutured closed and the operation is completed. The next picture shows you the surface of the heart before we start closing the skin incision. This lady returned to her home two days later, completely cured and with an excellent cosmetic result. The surgical scar was in fact completely hidden in the skin fold underneath the right breast. She went back to work ten days later. Please bear in mind that this minimally invasive expertise is not available everywhere. If you are told that “minimally invasive ASD repairs or myxomas cannot possibly be done through a minimally invasive approach”, please feel free to share this website and related videos with your doctor. She was also very glad she took the time and effort to research the best operation for her condition. Most cardiac surgery centers do not have the necessary technical expertise to offer minimally invasive atrial myxoma surgery. The alternative would have otherwise been a 12″ long incision up and down her chest, through her breastbone, with a longer recovery time and a frankly unnecessary lousy cosmetic result for the rest of her life. It is well worth the travel to a specialized center, even if it is out of state. Know your options and do not be shy about demanding the best treatments for you. It’s your body, your heart, your life! Click on the images below to view videos describing a minimally invasive atrial myxoma resection techniques. Click on the image below to view another video describing a minimally invasive atrial myxoma resection. This section has been prepared in response to the requests and questions of several concerned families affected by this genetically transmitted condition. The Carney’s Complex is characterized by the presence of cardiac myxomas, skin lesions, other tumor diagnoses and hormonal dysfunctions. About 7% of atrial myxomas in a heart surgery practice are found in families affected by this rare disease complex. I will explain step by step what you need to know and do about the cardiac manifestations of this complex disease. A timely and precise management of intracardiac myxomas will allow most patients to quickly resume a normal quality of life and peace of mind. Most myxomas can be safely and effectively removed with a minimally invasive technique that only requires a 2″ incision hidden in the skin fold underneath the right breast and two days in the hospital. See video above for technical details and a step by step narration of this surgical procedure. Most patients will relate a history of first degree relatives affected by the cardiac myxomas and skin tumors or pigmented spots on the skin. I often receive calls from mothers that already had surgery for atrial myxomas and want to inquire about minimally invasive techniques to remove the same type of cardiac myxoma in their young daughter or son. The Carney’s complex has a very strong genetic component and entire families can be affected. Other patients are referred to our service by physicians that are treating patients with associated signs of Cushing’s syndrome (a hormone dysfunction) or by a skin specialist during the evaluation of pigmented skin lesions or cutaneous tumors (skin myxomas). Every patient is different and not all the symptoms are present at the same time. Here is a summary of the most common physical findings by organ system. TIA’s (Transient Ischemic Attacks), also known as “ministrokes”. They usually are short-lived episodes of numbness of face, hand or leg areas, slurred speech, drooping of the eye or mouth, difficulty in finding the right words during a conversation. A listen to the heart with a stethoscope will occasionally reveal the presence of a murmur caused by the cardiac myxoma. This murmur is related to the disruption of blood flow inside the heart and by the tumor interference on the heart valve function. Transthoracic Echocardiogram (TTE). It is a noninvasive imaging study that uses ultrasound waves (same as a sonar in a submarine) and can quickly show the size and location of the cardiac myxoma within the heart. This test is painless and is carried out by simply leaning a smooth ultrasound probe against the chest to scan the heart chambers. Transesophageal Echocardiogram (TEE). It uses the same ultrasound technology of the TTE but this time the probe is passed through the food pipe (esophagus) into the stomach, pretty much in the same way a gastroscopy probe is inserted. This exam allows for a closer look and sharper echocardiographic details of the heart structures. Genetic testing. These tests might be appropriate if a suspicion of Carney complex is raised. That could translate in valuable information to decide whether or not the rest of the family needs to be checked for the same pathology. Referral to an endocrinologist is indicated if hormone imbalance is present. A dermatologist can be consulted to evaluate skin lesions. Electrocardiogram (EKG) can be very non-specific. It might occasionally show evidence of enlargement of the left atrial chamber and signs of pulmonary hypertension. Unfortunately, cardiac myxomas cannot be treated with medications or drugs. Blood thinners are not indicated as a way to prevent strokes or embolic events because these events are caused by fragments of myxoma that break off and travel to the brain vessels. In other words, blood thinners can help melt blood clot away but they have no effect on tumor fragments. The recommended therapy is a surgical resection as soon as possible to prevent any complications. I still have to meet a patient who is sincerely thrilled with the prospect of an open heart operation but I do have great news on this subject. All atrial myxomas, regardless of size or shape can be safely and accurately removed with minimally invasive techniques (see video above). The operation does not leave any visible scar and it allows a quick and uneventful recovery. It has the great advantage of much less bleeding, pain, chance of infection than the traditional breastbone splitting operation and most patients can be discharged home two days after surgery. If you are interested in more details and images related to the Carney’s complex, read the excellent review by N.A.Courcoutsakis et Al. with pictures of typical Carney’s complex lesions. I made it available to you as a free pdf file download.